Ahem…I never lied. I said I was making it for a friend, didn’t I? The blog doesn’t say anything about the recipient of the tea cozy. That’s pretty sneaky! But sweet. :) And I do that to my SIL all the time about socks I’m working on. Very nice. Your tea looks so cozy! That is awesome! You’ve got some great sneaky friends! I did that to my sister too when I was knitting the Juno Regina Shawl. I took it down south with me when I visited her. Had her help me block it too. LOL I had her model it for me and you should have seen her face when I told her it was for her. What Marsha has failed to mention is that she too is pretty sneaky. I gave her some sock yarn for her birthday and she knit socks “for herself” in front of me, had me try one on and then gave them to me for my birthday! Ooh, what a lovely cosy! I do like a classy tea cosy, and even a vulgar one for that matter! Love it! 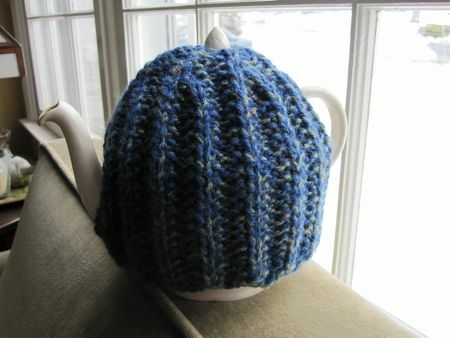 So do tea cozies actually keep the tea pot warmer longer? I was always curious about this! @Knit Nurse: I have three tea pots, and I’m thinking about making cosies for the other two–something to match their “personalities.” One will definitely have to be as frilly and “vulgar” as I can manage! @Gina: YES! It really works!